This project is for complaint about data at Ministry of Education Division of Educator, this application is use widely in Indonesia. Target User about 100K Users, where 1 User == 1 School. For this project, We use 3 virtual servers. Each server has 3 Virtual Core, 8Gb Ram and CentOS 6.6. We use separate process on separate server. The ticketing system is tiered. So School can only send ticket to Cities. Cities can send tickets to Province, and Province can send ticket to Admin of Ministry. Forwarding system also tiered, Cities can forward to Province. Province can forward to Admin of Ministry. And Admin of Ministry can forward to their fellows. Every ticket, can has attachment, up to size 5Mb. Extension for upload can be set too. 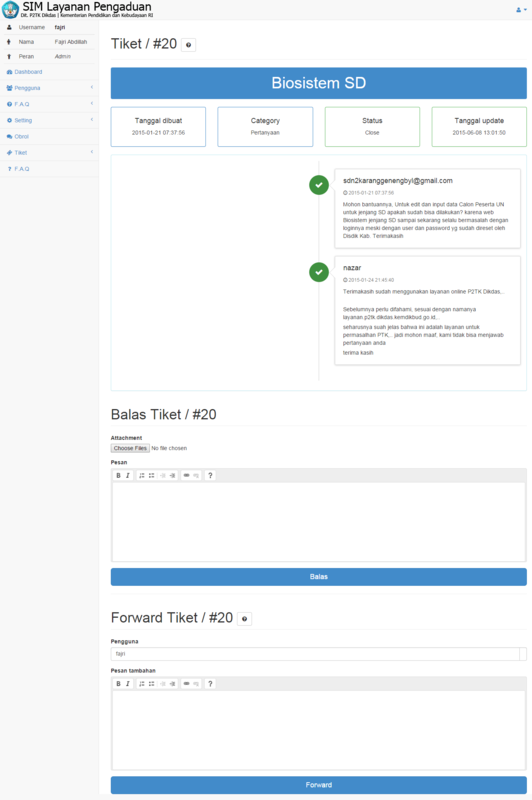 And, every activities, make ticket status changed into, open, answered, forward, and close. User interface built to easiest operation, and truly straight forward. This project has so many user, because this application targeted into 100K users all of Indonesia School. And it has 4 Role. When ticket sent, it must be somebody to take care about the ticket, what happened when someone has too much ticket to handle? Building multi user and multi role application is a little hard, especially when do automated testing.